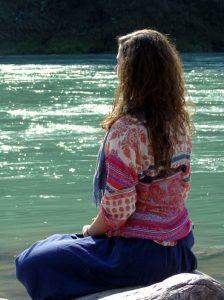 HOW TO REACH YOGA ESSENCE, RISHIKESH? Jolly Grant domestic airport at Dehradun (DED) is the nearest airport to Rishikesh which is approximately 25 km away. Popular carriers like Indigo, Air India, Spicejet and Jet Airways often have daily flights from New Delhi to Dehradun Jolly Grant airport. Once you reach at the airport; you can opt for regular taxi to our school or Yoga Essence can send known taxi for pick up on request. Note: – The taxi person will available at arrival gate with Yoga Essence Placard and may be along with a paper having your name so that you can recognize him easily. The second nearest International airport for Rishikesh is in New Delhi Indira Gandhi International Airport which is well-connected with different cities across the globe. The drive from Delhi to Rishikesh would take approximately 7 hours. You can opt for taxi to Yoga Essence Rishikesh directly. The nearest railhead to Rishikesh is in Haridwar which is approximately 25 km away. Haridwar, in turn, is linked to major Indian cities. Some of the popular trains are Shatabadi Express, Jan Shatabadi, AC Special Express and others. For those making the journey to Rishikesh, it is advisable to take the train till Haridwar and then either take a bus or hire a taxi to Rishikesh. While the bus would take about 1 hour, the taxi will take you to Rishikesh in about 1 hour. However traveling will cause inconvenience for the first time travelers. Being a popular tourist destination, Rishikesh has a good network of buses connecting it with important places such as Haridwar, Dehradun and New Delhi. Buses depart in the morning and late evening from the Kashmiri Gate ISBT, New Delhi for Rishikesh ISBT every day. You can choose from a regular, deluxe or a luxurious coach. However traveling will cause inconvenience for the first time travelers.